It was easy to make. First I just needed a base that tasted like vanilla cake batter. I accomplished this with a mixture of cashew butter and coconut butter sweetened with a bit of maple syrup, some vanilla of course, and then a little almond extract. I know this is a vanilla cake, but both my Grandma and my Mom would always add a little almond extract along with the vanilla when making a vanilla cake or vanilla sugar cookies (and the frosting). It just gave it that something extra that made it taste special. The mixture I made did taste just like cake batter! It was even better once I mixed it with the popcorn! I then had to add sprinkles to make it pretty. 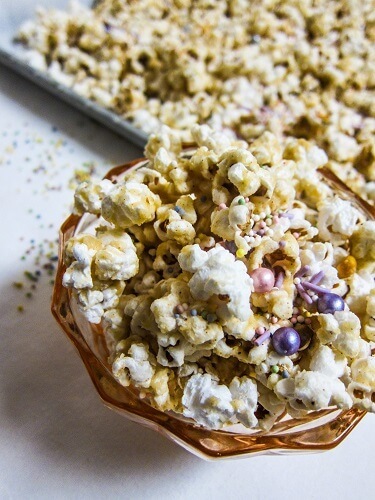 Because it wouldn't be birthday cake popcorn without some celebratory flair! I know, it isn't anyone's birthday, but why not enjoy some birthday cake any time you want?! It was super delicious! It tasted like vanilla birthday cake complete with sprinkles and all, but with the delicious crunch of popcorn plus a hint of sea salt. 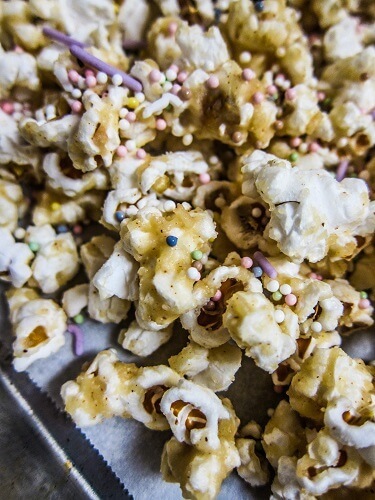 Totally crave worthy, but I am always a sucker for a salty, sweet and crunchy combination! If you love vanilla cake as much as I do, give this a try! 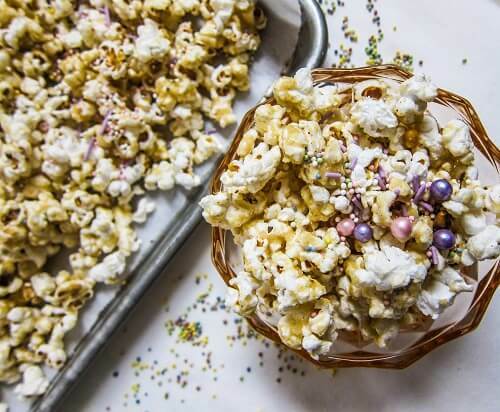 It is way better than the gourmet popcorn you can buy at the store. 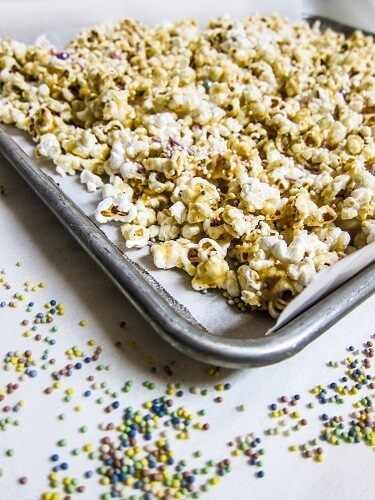 To make the coating, whisk together all ingredients but the sprinkles until smooth, then pour over the popcorn in a large bowl. 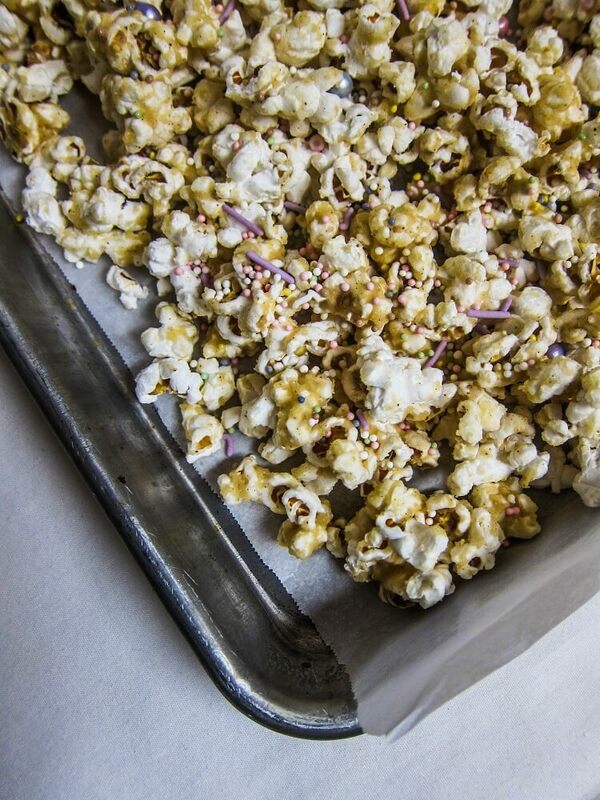 Toss together until all of the popcorn is coated, and spread out on a parchment lined sheet pan. Sprinkle with the sprinkles distributing them evenly. Place the pan in the freezer for 15 min until the coating is hard. Enjoy!